Over the years, friends have sought advice about relationships. I’m not an overly qualified – or interfering – agony aunt kind of a person, I just mean those conversations that come up over morning coffees and late night cocktails as people wonder if a particular love interest is working out, are they worth the extra effort and ‘is he or she THE ONE’? One friend, while drawing up a list of pros and cons about their partner, asked how they’d truly know if this was the love of their life and my answer – the fact they were writing that list and even questioning the relationship – was simply, you’ll just know. Yes there will be ups and downs and reasons to feel frustrated with, or maybe even momentarily hate, the most important person in your life, but beyond all shadow of a doubt, that underlying love and need to be together will win out. True love is unconditional, all consuming and inescapable. It might have made more sense to talk about love a couple of weeks ago, on Valentine’s Day, but it sort of passed us by this year. We were forty eight hours out of hospital with our brand new baby (twenty four if you count a nerve wracking trip to A&E the night we were discharged) and celebrated with supper on the sofa. The love around us was undeniable, but rather different, manifested in the homemade pizza I made us to eat, in Luke changing Nino’s umpteenth nappy while I served up ice cream for dessert and our stunned, contented silence as we simply stared and stared at our son (our son!). Less of the romantic bows and arrows sort of love but every bit as all-consuming, undeniable and inexplicable. Before I had children, I thought I had love sussed out. There was the love I felt for my family, deep-rooted and unconditional, a bond that weathered arguments and time apart and was never even questioned. There was the love I felt for my friends, strong and warm and loyal. And there was the love I felt for Luke, from those first moments of falling in love to the incredible, everyday expansion of my feelings. I thought our baby boy would slot right in amongst all this, but instead he’s clean bulldozed out a whole new section of my heart. To say it’s something you can’t understand until you have a baby is the kind of comment that might have annoyed me before Nino was born, but if you have children of your own, I think you know what I mean. Above all I feel privileged that Luke and I are lucky enough to be your parents, to hold you and grow you, to nurture and nourish and to love – and to be loved, unconditionally by – you. 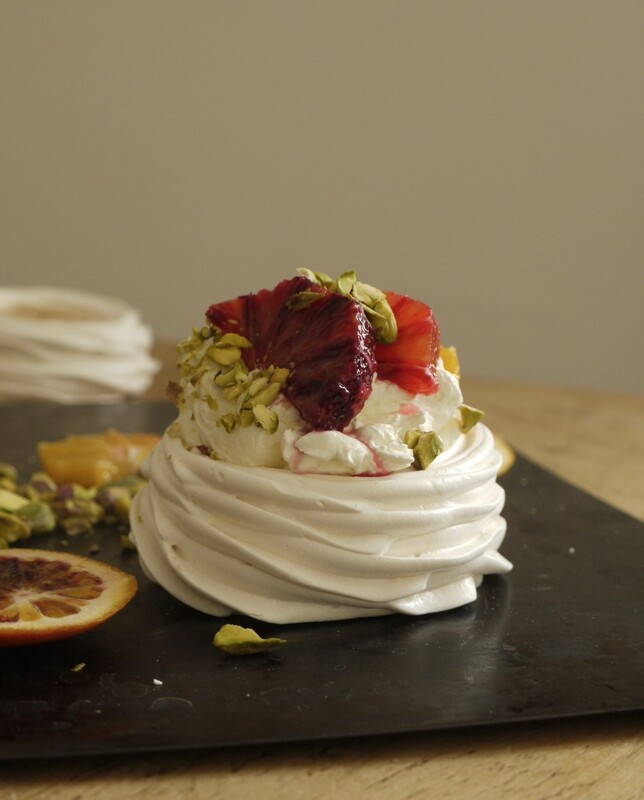 ps blood orange pavlovas! I made these for Mothers Day lunch (my first as a mother, the main course being a spoily roast affair cooked by my own Mum) and Nino kindly obliged by snoozing solidly in his Moby Wrap throughout the process. Individual sweet, crisp meringues filled with pillows of whipped cream and topped with juicy seasonal blood oranges. 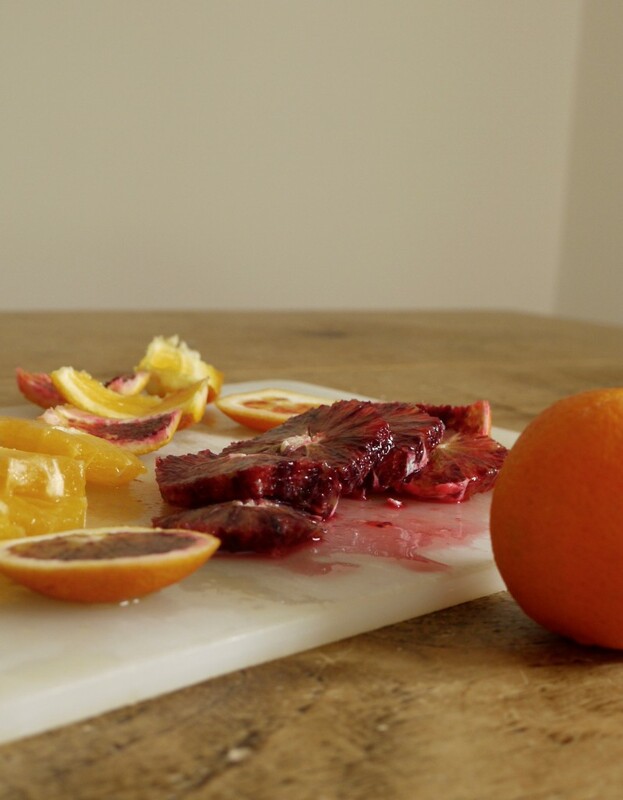 Out of season, regular oranges will also work well, and you could swap out the pistachios for toasted flaked almonds, grated chocolate or cocoa nibs, if you like. Preheat the oven to 120 degrees C/100 C fan. Line two large baking trays with parchment paper. Whisk the egg whites in the bowl of a stand mixer until soft peaks form. With the whisk still running, slowly add the caster sugar, 50g at a time, and continue to whisk until smooth, thick and glossy. Sift the icing sugar over the meringue mixture and fold in. Spoon or pipe eight meringue nests onto the prepared baking sheets and bake for 1 and ½ hours until crisp on the outside. Turn the oven off and leave the meringues inside to cool completely. When ready to serve, whip the cream and vanilla extract until soft peaks form. 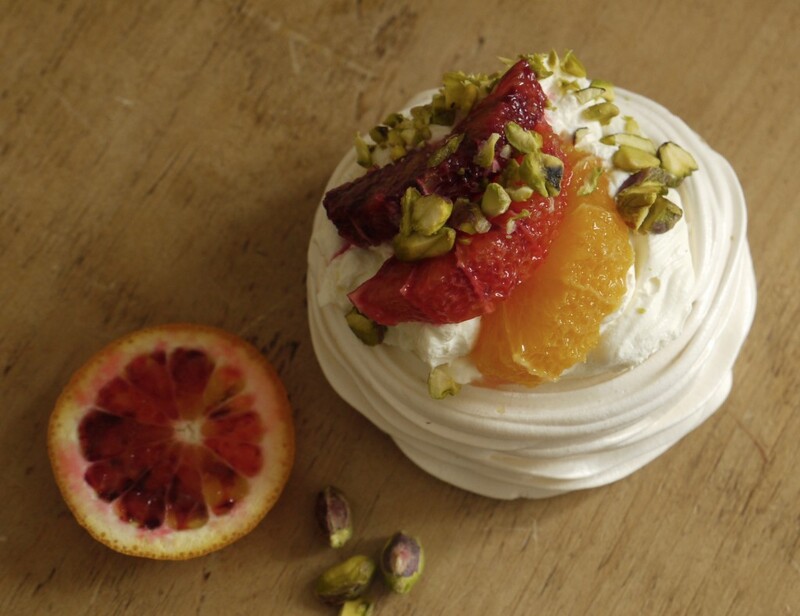 Divide the cream between your meringues and top with blood oranges slices and a sprinkle of pistachios. If you have a sweeter tooth, you could add a little sugar or honey to the whipped cream, but I find the oranges and meringue make these sweet enough. Beautiful post, it is incredible the love you feel. 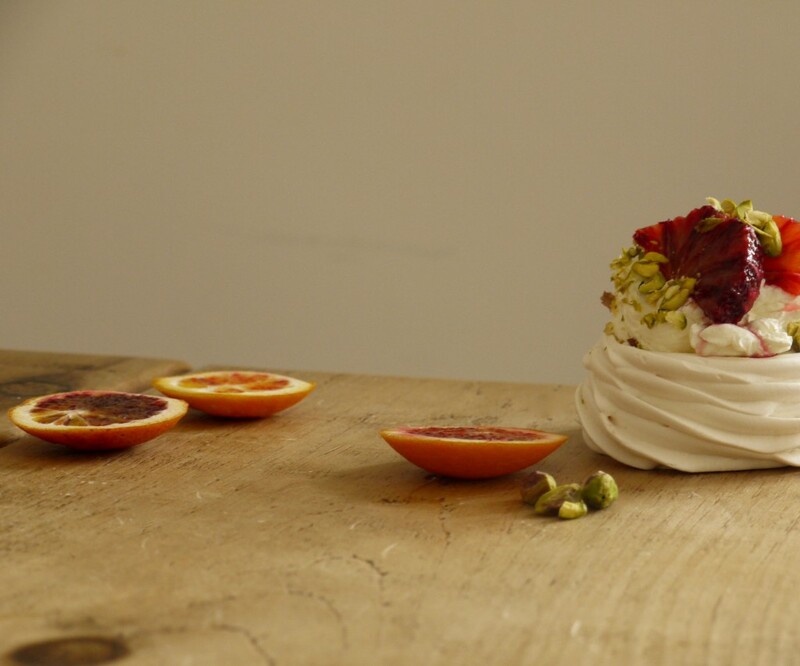 These pavlovas look divine too, might need to add them to my easter baking list. Another beautiful piece of writing. Very best wishes over the coming weeks, am sure little one will prove to have an appetite for life that matches your exceptional culinary (and literary!) skills. Go Nino! Ahh, Kate. I’m only one week deep and I share your feelings so much. 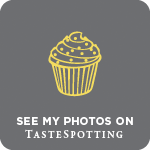 Beautifully written, and those pavlovas look great. I threw my little man into a sling on day 4 and baked a batch of muffins – it was so great to do something normal as we ease into our new life together. The pavlovas look amazing! I’ve never thought of using blood oranges, but now it makes sense to be that the citrus would pair well with the fluffy sweet pavlova. Gorgeous!!!! Looks yummy are Pavlova’s hard to make? What a wonderful post, so beautifully written and emotive. 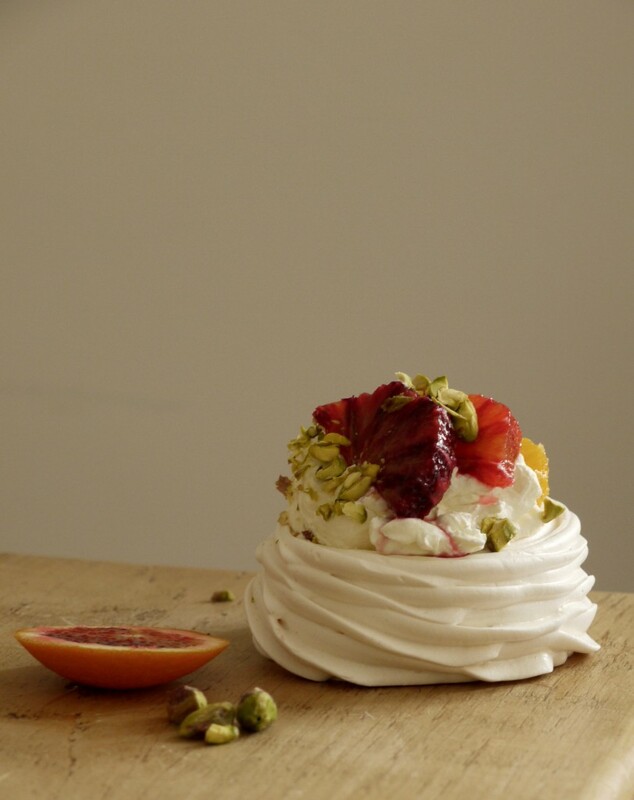 The pavlovas look utterly stunning, too!